Wow Man, It's a Double Rainbow From Space! Behold a double rainbow from space! Well, technically, it's called glory, but it just looks like a double rainbow from the top. The optical phenomenon was captured by the Moderate Resolution Imaging Spectroradiometer on NASA's Terra satellite, orbiting over Baja California. The image—which has been enhanced to highlight the colors of the rainbow—is a very rare sight from space. In fact, the first sighting ever happened only in 2003, when the crew of the space shuttle Columbia photographed a circular glory from orbit. This one, however, appears as two parallel bands of colors "that run parallel to the path of the satellite, rather than a full circle." Glories generally appear as concentric rings of color in front of mist or fog. They form when water droplets within clouds scatter sunlight back toward a source of illumination (in this case the Sun). Glories always appear around the spot directly opposite the Sun, from the perspective of the viewer. This spot is called the anti-solar point. To visualize this, imagine a line connecting the Sun, a viewer, and the spot where the glory appears. In this case, the anti-solar point falls about halfway between the two colored lines of the glory. Glories are usually seen against a background of white clouds. Clouds are white because the sunlight is scattered many times by multiple droplets within the clouds. The white light often obscures details of glories, but without them in the background, the glory would not be visible. 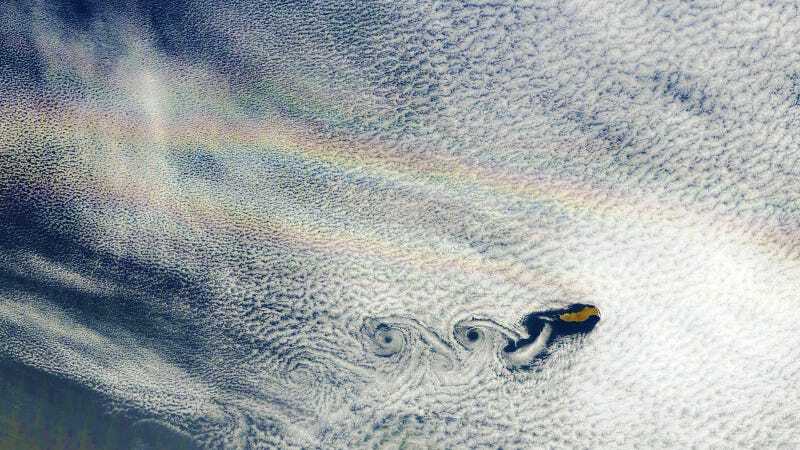 Here is the complete image, showing the bands of colors parallel to the North American west coast, running over stratocumulus clouds, near the island of Guadalupe, in the Pacific Ocean.